“How fantastic!” “How fabulous!” were some of the comments heard at the 2nd annual Holiday Open House on December 1 and 2, 2017 at Virginia Robinson Gardens. Last year, the Friends’ wonderful president Marian Power came up with the idea to hold a festive holiday celebration in the style of the 50s, in the spirit of Virginia who threw legendary parties. It was so successful that the event was expanded to two days, and the Holiday Open House has now become an annual tradition. Helmed by the incredible co-chairs Kathy Choi and Patty Elias Rosenfeld, the event was even more beautiful, elaborate and exciting this year. The façade of the house, sumptuously festooned with flowers, ornaments and leaves and pink poinsettias in urns on the roof set the tone for the dazzling displays within, thanks to the wonderful work of designer Kenneth Boyer of Atelier K. Several Christmas trees, each with a different theme adorned the rooms. Echoing the blue and white delft porcelain in the living room was a snowy Christmas tree with silver and blue ornaments, decorated by Patty, Kathy and Kathleen McGillivray. The library, exquisitely decorated by Kerstin Royce, Ellen Lipson and Patti Reinstein, referenced the “Grand Tour” that Harry and Virginia Robinson took around the world in 1911. Glittering suitcases, globes, elephants and exotic ornaments adorned the tree, while an elaborate silver tea set and mannequin wearing one of Virginia’s glamorous, sparkling evening gowns enhanced the refinement of the scene. The entry hall was swathed in shades of pink, from roses and poinsettias to ornaments on the tree that reflected Mrs. Robinson’s favorite color. Christine Centolanza, Rosanna Grabel and Janice Olds helped decorate the lovely tree. A recreation of a miniature tree belonging to Virginia from the 50s featured pink origami birds perched on the branches. The dining room was a breathtaking tour de force. A shimmering white Christmas tree, decorated by curator April Walton with vintage ornaments created a magical effect while the tablescape, designed by Corey of Sweet Peas Custom Floral and Christofle was unbelievably stunning! Christofle also had silver jewelry for sale, while The Friends Boutique in the Loggia did a brisk business with many beautiful bargains to be had, thanks to Jeanne Anderson who did a fabulous job! The entire proceeds from the Friends Boutique went in support of the Children’s Program at the Gardens. Our wonderful docent David Bronstein shared brief cultural histories of the Robinson estate with the guests. In the kitchen, celebrity chef Pamela Salzman served vegan mac ‘n cheese that was so delicious, it inspired many to buy her book, Kitchen Matters: More than 100 recipes and tips to transform the way you cook and eat – wholesome, nourishing, unforgettable. A delicious array of cookies (many baked by the Friends) and savory refreshments were elegantly served in the Pool Pavilion. The many fun boutiques, recruited by Dana Reston Lyons, featured great clothes by IRO, Mini Dreamers, Jila, Belafit and Connie Roberson, jewelry by Elisabeth Pole Designs, and designer eyeglasses by Yaron Tamir. Laureen Bozajian of Gift Box Wrapsody sold gorgeous, festive holiday boxes while Friends member Marcella Ruble displayed her whimsical ceramic holiday brooches. A tasting was offered of Jardesca, a refreshing aperitif of wine, eau de vie and botanicals. 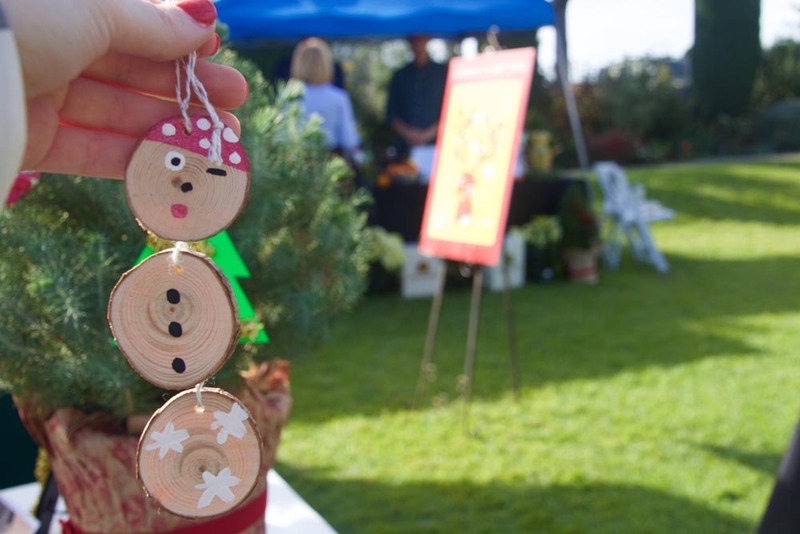 The vendors generously donated 20% of the proceeds of all sales to benefit the Gardens. Thank you to all those who have worked so hard to give us such a fabulous day including our amazing Lynda Curland, Director of Operations for the Friends, our wonderful Grounds Caretaker Josh Johnston, Curator April Walton and County staff, and our fantastic Superintendent Timothy Lindsay — all for a great cause – the Virginia Robinson Gardens whose resplendent beauty has given solace and joy to so many.